We were in for a looonnngggg drive after leaving the Greensboro Campground, but we didn’t know just how beautiful of a drive lay before us. Our trip took us north thru North Carolina, into Virginia, West Virginia and on into Ohio. The drive was absolutely spectacular. One of the most scenic drives I’ve ever been on, but I have no pictures to share because I was driving. For a matter-of-fact, once I got comfortable behind the wheel of Georgette, hubby planted himself in the passenger seat and hasn’t driven since. Yes folks, I really do have control issues, but hubby also enjoys being the passenger more than the driver. We stopped in Dayton, OH for the night at the Dayton KOA. We got there in time for hubby and the 3 oldest to go for a swim while I stayed back to get things ready for our evening. Although I didn’t get out to explore the campground, I’m told by hubby and Lili, that it is an awesome campground and we need to go back to visit for more than just a night. I don’t think it will happen this year, but it sounds like we’ll be putting it on our campground list for next year. Unfortunately, because I didn’t get out to explore, I didn’t get pictures again. Plus, two of our dogs were having tummy problems which meant I was making more that usual trips outside with them. Our Great Southeast Adventure had it’s fair share of challenges. Since we don’t have perfect children . . . . let me rephrase . . . since we have perfectly normal children, there was bickering, arguing and fighting from time-to-time. Hubby and I weren’t always on our best behavior every moment either. FS1, while appearing to have a good time on our trip, was also out-of-sorts which was stressful and yet somewhat expected. However, despite those little stumbles along the way, we built lovely memories on our trip and in many ways we can thank Georgette. I also learned a lot from our adventure. – Thanks to hubby, I think I can now set everything up on my own at campsites. 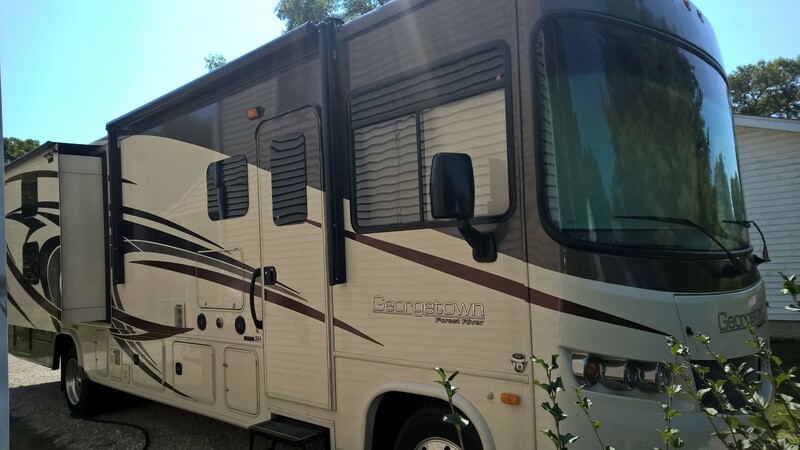 – Getting from place to place in an RV just takes longer. While we certainly saw many RV’s flying down the interstate, we kept Georgette at recommended speed limits for safety. Allowing ourselves more time and enjoying the sites along the way will make future trips much more enjoyable. – Traveling as a family of six with that much room is much more comfortable than sitting in a vehicle while driving across 8 states (9 if you count crossing into South Carolina several different times on this trip). It’s really is nice being able to stop for the night without unloading luggage only to load it again the next morning. I suppose one could argue that you still have to do some set up for the night, but an overnight stop set up is minimal and probably takes less time than hauling luggage back and forth. Although the girls do enjoy riding on hotel luggage carts 🙂 They probably consider that the downside of RV travel. – Being able to take our dogs with us has its own set of challenges, but is better than trying to find someone to watch them or boarding them while we’re gone. Plus, they really like going. – Having our own beds to sleep in each night is NICE!!!! – I really should use a set up and tear down checklist. I know I forgot to strap the refrigerator/freezer doors at least twice on this trip. Oops!!!! Of everything I learned, the most prevalent was coming away from this trip with a greater understanding of how much better our lives would be if we lived smaller. Smaller house, less stuff = more time to enjoy life. As such, I have once again begun throwing things away and clearing out the junk in our lives. I must admit, it’s hard. One cannot spend this many years accumulating things they want or ‘might need one day’ and easily begin tossing without the hold habits surfacing. And they surface often, but I’m working on it. So thank you Georgette! You carried us across 9 states and helped to make this trip a wonderful adventure! !